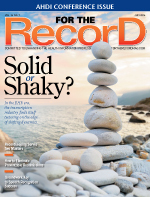 Recordkeeping must satisfy patient care needs and legal obligations, a tall task in an increasingly electronic environment. The volume of health care–related data continues to grow at a blistering pace. For beleaguered hospitals, it’s becoming more difficult to handle the onslaught. If these data aren’t properly managed on the front end, it will cost health care organizations exponentially more on the back end when responding to subpoenas, investigations, or litigation. Invigorated by the passage of the ARRA, in which President Obama earmarked $19 billion in stimulus funds for HIT projects, EHRs steadily have been replacing paper records. As a consequence, the resulting volume and sources of electronic data are eclipsing the information management capacity of most health care organizations. According to Iron Mountain’s 2013 white paper Redefining the Role of Health Information Management in the New World of Information Governance, this has led to inadequate information management policy and an infrastructure that breeds unnecessary risk and requires costly workarounds. Ideally, what constitutes a useful and adequate clinical record should be the same as what makes up the foundation of a business or legal record, but that’s not always the case. Traditionally, health care organizations have been siloed in their approaches to records management, with individual departments responsible for their own records, says Linda Kloss, CEO of Kloss Strategic Advisors, adding that this can lead to practice variations, process inefficiencies, and higher record management costs than if the organization adopted a more holistic view. “It’s perfectly understandable that there would be that kind of siloed, decentralized responsibility for records management historically for paper records but, as with so much now in information management, the transition to digital records is a game changer,” she explains. Today’s physicians are so busy that data often are stored and inputted in various formats, resulting in a mixed model of paper records combined with electronic ones. For example, nurses may take an electronic device to the bedside but not immediately transfer that information into the EHR or they may combine that information with paper notes and wait to input it later at the nurses’ station. This can create an evidentiary problem. “When it comes to gathering information for litigation, the accuracy of the record is sometimes put into question because of the time frame and the transfer from paper record to electronic record, making it unclear if the data are completely accurate from a legal point of view,” says Kathryn Coburn, a health care attorney with Cooke Kobrick & Wu. She explains that if the EHR isn’t properly organized, attorneys may have to painstakingly comb through records and ultimately request additional information to defend or prosecute a case. This often comes at a significant expense to hospitals and delays commencing action. New systems should be architected to allow for the efficient retrieval of medical evidence. The Federal Rules of Civil Procedure make it clear that courts expect attorneys to be ready for litigation and to be aware of the network architecture of their clients’ systems so that their pretrial conferences lead to agreements regarding which electronically stored information is discoverable. Failure to identify information essential to the client’s case can severely prejudice the outcome. Kloss believes the danger of inadequate records management transcends paper or electronic considerations. “What’s useful in a clinical record vs. what’s an adequate record from a business or legal standpoint is a definitional issue that exists regardless of form,” she says. In general, a legal health record contains the documentation of patient care as noted by the health care organization. It’s used within the organization as a business record and made available on request from patients or legal services. While there’s no specific set of regulations for legal health records, they still must meet standards set by federal and state laws. Once those requirements have been satisfied, it’s up to the individual health care organization to decide what is and isn’t appropriate to reveal. For example, administrative records or documents from institutions that previously treated a patient may not be part of the legal health record. “Remember that the legal health record is a subset of everything in the electronic health record,” adds Denise Dunyak, MS, RHIA, FAHIMA, a marketing specialist at Siemens. Traditionally, the legal health record was whatever appeared in the paper chart. However, because more facilities are adopting EHRs, using health apps for patient monitoring, and tracking data on various forms of electronic media, defining and creating a legal health record is becoming more complex. Bradley P. Blystone, a supervising attorney for the health care liability group for the law firm Marshall Dennehey Warner Coleman & Goggin, recommends hospitals invest in HIT infrastructure that will allow them to view how electronic records will translate to hard-copy versions. “The disconnect happens when a system looks great on the computer with touch screens and drop-down menus, but that doesn’t necessarily translate to the courtroom where the record needs to be printed out and presented as a cohesive record that can be easily comprehended,” he notes. From Blystone’s perspective, the ideal EHR is composed of a typewritten computerized chart that can be easily read. It should contain “old-style” narrative notes that chronicle and explain a patient’s history of care. If that isn’t possible, Blystone suggests hospitals work with records management vendors to modify their product to enable it to print records in a user-friendly format. He likens this challenge to the “typical disconnect between the medical and legal worlds,” noting that few providers have a thorough understanding of their many data sources, characteristics, and uses and are unfamiliar with access requirements and the flow of information, making it difficult to establish and enforce consistent records management policies. Tera Rica Murdock, an associate at Waller, Lansden, Dortch & Davis, notes the importance of gaining buy-in from the top down. “Management, physicians, nurses, and assistants must all be trained and understand the benefits to the system and the risks in ignoring it,” she says. Many health care organizations view medical records as a blend of structured and unstructured data but fail to consider how the information should be managed over time. As a result, traditional issues such as retention policies, archiving, and disposition may need to be executed differently in an electronic system than they were in the paper-based world. During the implementation of a records management system, Dunyak says it’s important to conduct a forms inventory to determine the origins of paper-based medical records, such as from lab results, operating room systems, or discharge summaries, and identify where they may be slipping through the cracks. Also, if physicians create patient charts using a two-step process, either by dictating or writing notes to be transcribed, it’s a good idea to convert the dictation to an electronic audio file or scan copies of the notes to make sure these records become part of the EHR. In an electronic environment, many experts agree that often it’s difficult to tell a patient’s story in chronological fashion, something lawyers are used to with paper records, where the information is displayed from start to finish with data integrated into defined sections. Threading the story together in an EHR is more complicated because, although the record often includes the laboratory and progress notes arranged by practitioner in chronological order, it also weaves in extraneous information from the patient’s entire medical record and not just one specific case. Today’s records management challenges reflect a system in transition. Because information creation, storage, and use still are decentralized across many applications, a great deal of thought must be given to how to approach it across organizations. Providing guidance and establishing policy on the long-term preservation of information must be a priority. How will legacy records be stored and archived? What steps are necessary to make the organization compliant with retention laws? How will facilities take advantage of up-to-date storage solutions that consolidate information silos? Ideally, data should be captured once and used for various purposes, making the need to define and maintain designated records sets, including legal health records and other record types, even more important. It’s critical to weigh an organization’s clinical and business needs against all applicable legal and regulatory requirements. According to the Iron Mountain white paper, this involves managing the plans and processes for storage, retention, and disposition of medical and business records while keeping in mind access needs, compliance, and cost-effectiveness. If the information is of no value to business operations or patient care, many experts agree that it shouldn’t be retained for longer than legally required. To address this situation, Hubbard recommends creating a document retention policy. To boost detail in the EHR, Blystone encourages clinicians to type in extra comments when warranted. “Even if it’s just a few words, it helps remove any conjecture later on,” he says. No matter the records management system, it’s important to have an effective process in place for defining designated sets and legal versions while promoting quality documentation. It’s equally critical that the system monitors and enforces rules and regulations as they evolve over time. — Amanda Griffith is a freelance writer in Norton, Massachusetts, who specializes in health care and HIT topics.